Ceres has too much water! The uncertainty of science: In a paper released today, scientists puzzle over the amount of water they have detected evaporating from the dwarf planet Ceres, finding that observations by Dawn of its surface do not provide enough water sources to explain the amount of water in its thin atmosphere. The dwarf planet Ceres, the largest object in the asteroid belt, is known to contain large amounts of water ice, and water vapor was detected around it. Possible sources of the water are surface exposure of ice through impacts and subsequent sublimation when heated by sunlight, or volcanic activity. It turns out that with either process it is difficult to create sufficient water vapor to explain the observations. This means that the geological processes on Ceres are not fully understood. They propose several possible explanations for the discrepancy. Either the measurements of evaporation are wrong, or they have not fully mapped the surface water sources on Ceres. Either or both are certainly possible, as there are great uncertainties here. To me, the most interesting quote from their paper however is the amount of water discovered. Besides finding water on the surface at nine locations “localized on crater floors or slopes, and generally in or close to shadows,” they also found a lot of water under the surface. The gamma ray and neutron detector on Dawn discovered a global ice‐rich layer in the subsurface of Ceres, at a depth of ~1 m in equatorial regions and much closer to the surface in polar regions. The estimated abundance of ice in this layer is ~10%. … Evidence for ice on depth scales of a few kilometers is [also] reported by Sizemore et al. (2018). From the analysis of geomorphological features, they find that the distribution of ice is heterogeneous on scales of 1 km to hundreds of kilometers. In other words, Ceres has a lot of water below the surface, even if the evaporation rate observed by Dawn does not at present match the amount of water vapor observed surrounding Ceres. Cool image time! The Dawn science team has released some additional images taken shortly before the mission’s conclusion when Dawn was in its closest orbit of the dwarf planet Ceres. On the right is a tiny cropped portion of a much larger mosaic of the bright spots on the floor of Occator Crater, focusing on one large bright spot that also includes a fissure cutting across it. If you click on the image you can see the entire mosaic, covering an additional four more bright areas. The mosaic was taken in June 2018 from a distance of 21 miles. The press release describes these bright areas as “deposits of salts, in particular sodium carbonate, possibly extruded through fractures connecting the surface to a deep reservoir of salty liquid.” That surely looks confirmed by the fissures in the image to the right. The Dawn mission has ended, and the image on the right, reduced to post here, is one of its last views of Ceres, with the bright spots of Occator Crater clearly visible, before its fuel ran out. You can see the full resolution image by clicking on the image. This photo of Ceres and the bright regions in Occator Crater was one of the last views NASA’s Dawn spacecraft transmitted before it depleted its remaining hydrazine and completed its mission. This view, which faces south, was captured on Sept. 1, 2018 at an altitude of 2,340 miles (3,370 kilometers) as the spacecraft was ascending in its elliptical orbit. At its lowest point, the orbit dipped down to only about 22 miles (35 kilometers), which allowed Dawn to acquire very high-resolution images in this final phase of its mission. Some of the close-up images of Occator Crater are shown here. Occator Crater is 57 miles (92 kilometers) across and 2.5 miles (4 kilometers) deep and holds the brightest area on Ceres, Cerealia Facula in its center and Vinalia Faculae in its western side. This region has been the subject of intense interest since Dawn’s approach to the dwarf planet in early 2015. If NASA made any specific announcement about the end of the mission, I have missed it. Either way, this end is not a surprise, because they have made it clear for the past few months that the spacecraft was about to run out of fuel. They have also posted today an image of Ceres’ largest mountain, Ahuna Mons. A new analysis of Dawn data suggests that the poles of Ceres have wandered by as much as 36 degrees, and the data also adds further support for the existence of a liquid water layer between the dwarf planet’s crust and mantle. In other words, the crust and mantle are not locked together. Imagine a baseball where the ballcover is not tightly held to the inner core, and slides around it. (Boy there are a lot of pitchers who wish they could get a hand on that baseball.) The cause of that looseness on Ceres is possibly because of a liquid layer in-between the crust and the mantle. Need I note that there are uncertainties here? Cool image time! As Dawn’s long and successful mission to the asteroids Vesta and Ceres winds down, the spacecraft is taking a slew of spectacular close-up images of Ceres. The image on the right, cropped slightly to post here, is an oblique view of Occator Crater, home to the double bright spots that scientists now believe are caused by the upward seepage of a water-based brine from the interior. The image was taken August 14, 2018 from a distance of 1149 miles. It clearly shows how the bright spots are depressions, not raised features. 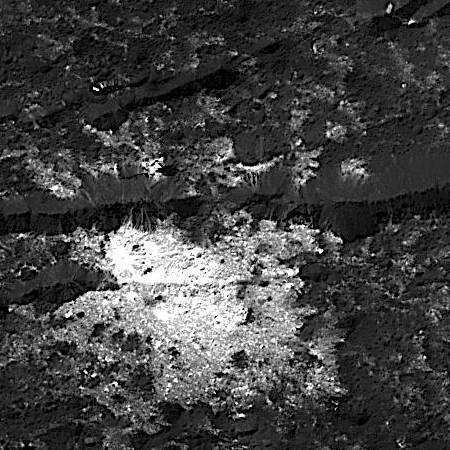 Additional images released this week of the floor of the crater capture a complex fracture network (seen here and here) with some fractures apparently quite deep. All this suggests that the surface crust of Ceres is not very structurally strong, allowing a churning process that plows material up and down. The data also suggests that even on a small planetary body like Ceres the geological processes are going to be complex and often on-going, depending on material, energy, and the size of the body. The uncertainty of science: A careful analysis of the Dawn data has found that though cryo-volcanism has occurred repeatedly on Ceres, it had less influence on the dwarf planet’s surface than previous models had predicted. At the same time, the data also suggests that Ceres has been more active throughout its history than predicted. They found about 22 domes that are apparently past cryo-volcanoes that have flattened out. Cool image time! With the Dawn spacecraft now swooping with 22 miles of the surface of Ceres every 27 hours, the science team has assembled a spectacular oblique image of Cerealia Facula, one of the dwarf planet’s bright spots thought to be brine deposits that at some point erupted up from below the surface. This mosaic of Cerealia Facula combines images obtained from altitudes as low as 22 miles (35 km) above Ceres’ surface. The mosaic is overlain on a topography model based on images obtained during Dawn’s low altitude mapping orbit (240 miles or 385 km altitude). No vertical exaggeration was applied. There are a lot of intriguing details in the full resolution image. I have highlighted one feature, indicated by the white box and shown in full resolution below. The Dawn science team has released their first artist’s concept of the interior of Ceres, based on data gathered by the spacecraft. Using information about Ceres’ gravity and topography, scientists found that Ceres is “differentiated,” which means that it has compositionally distinct layers at different depths. The most internal layer, the “mantle” is dominated by hydrated rocks, like clays. The external layer, the 24.85-mile (40-kilometer) thick crust, is a mixture of ice, salts, and hydrated minerals. Between the two is a layer that may contain a little bit of liquid rich in salts, called brine. It extends down at least 62 miles (100 kilometers). The Dawn observations cannot “see” below about 62 miles (100 kilometers) in depth. Hence, it is not possible to tell if Ceres’ deep interior contains more liquid or a core of dense material rich in metal. The most intriguing part of this concept is the existence of a brine layer below the crust. I suspect it is this layer that they believe is the source of the white salty brine that produces Ceres’ ice volcanoes and bright spots. Strange image time! 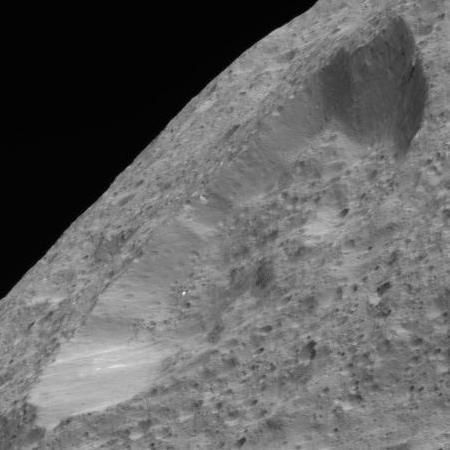 The Dawn science team today released a set of new images taken by the spacecraft in its new very close orbit of Ceres. The image on the right is a cropped section of one of those images, and shows some fractures and a dome in Occator Crater. The image was taken from 28 miles altitude, and if you click on it you can see the entire photograph. What immediately stands out in this image is the strange bright flow on top of the dome. At first glance it looks like someone put a seashell there. 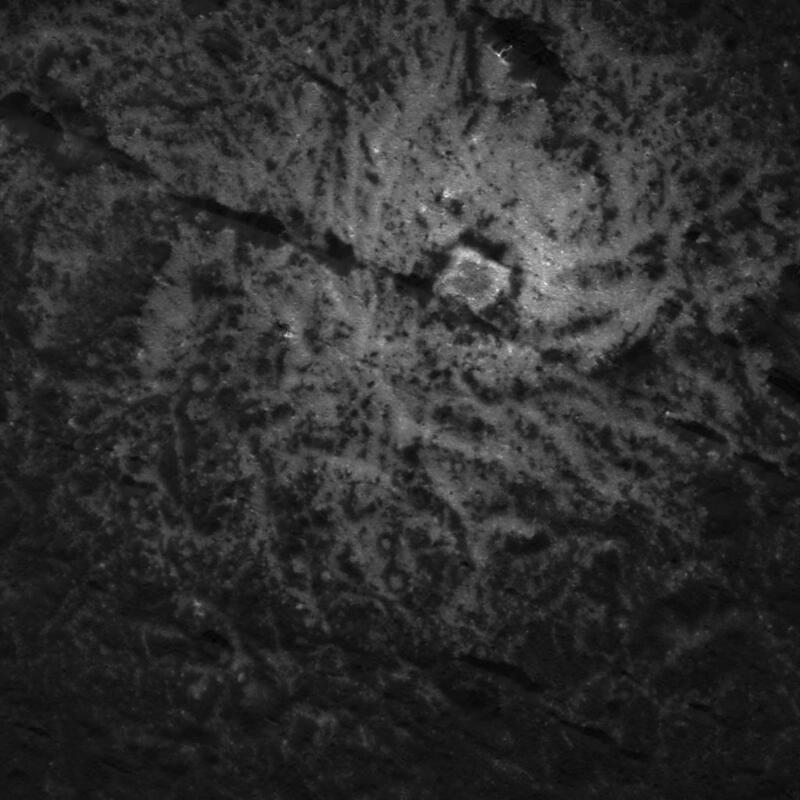 In reality I think it is showing us a landslide of bright material flowing downward, towards the top of the image. The flow was significant enough that it piled up as it went down, which is why it created a cliff edge and shadow line at its base. Everything we see here is influenced by Ceres’s tiny gravity. It is not unusual to see fractures in the floor of a crater, the nature of these fractures and domes is different, and will require a lot of work by scientists to interpret, because of the different environment. Cool image time! The Dawn science team today released some new images taken by the spacecraft in its final tight orbit around the dwarf planet Ceres. 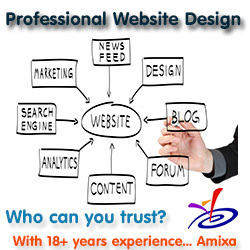 The image on the right is a cropped section of the full image. It shows some interesting details of part of one of the two bright spots in Occator Crater, dubbed Vinalia Facula, and was taken from a distance of 36 miles. Other images show small bright spots in another small crater, fractures and interesting patterns in the floor of Occator crater, a dome in Occator Crater suggestive of underground processes pushing up, and other close-ups of its crater walls. While all of these features are reminiscent of geology on Earth, none are really the same. Ceres’ light gravity and harsh environment, plus its history in the asteroid belt, requires alien processes that only hint at similarities to what we see on Earth. Cool image time! The image on the right, cropped and reduced in resolution to post here, is one of two images released today by the Dawn science team of the double bright spots found in Occator Crater, taken from the spacecraft’s tight final orbit above Ceres. This image shows what they have dubbed Cerealia Facula. The second image shows Vinalia Faculae. This mosaic of Cerealia Facula is based on images obtained by NASA’s Dawn spacecraft in its second extended mission, from an altitude as low as about 21 miles (34 kilometers). 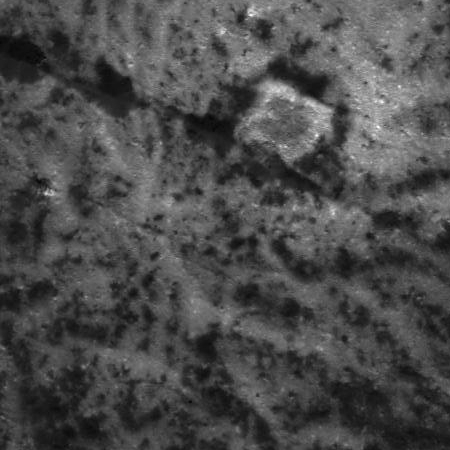 The contrast in resolution obtained by the two phases is visible here, reflected by a few gaps in the high-resolution coverage. This image is superposed to a similar scene acquired in the low-altitude mapping orbit of the mission from an altitude of about 240 miles (385 km). The second image on the left is a crop at full resolution of the area in the white box above. This gives you a taste of the many interesting things found in the full resolution image. For example, the bright spots scattered throughout this image suggest they are recent upwellings from below. The ridgelines in the upper right are either the remains of the water-ice volcano they think once stood here but subsequently slumped back down to form a depression, or pressure ridges being pushed up by later upwellings. The full image has lots more. So does the image of Vinalia Faculae. Check them out. Cool image time! 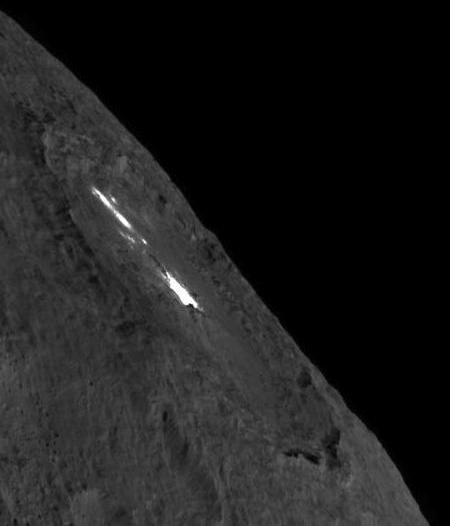 In this week’s release of new images from Dawn, the science released close-ups of one of the bright spots located on the floor of Occator Crater on Ceres. The image on the right, cropped and reduced in resolution to post here, shows one white-topped mesa in that crater. The geometry of this feature is similar to a mesa or large butte with a flat top. It has been puzzling scientists since its discovery in the early images of the Dawn mission at Ceres. These new images reveal many details. In particular, the relationships between the bright material, mostly composed of sodium carbonate, and the dark background might hold clues about the origin of the facula. If you click on the image you can see the full image at full resolution. The sun appears to be coming from the southeast, with the mesa’s cliff’s at the top. 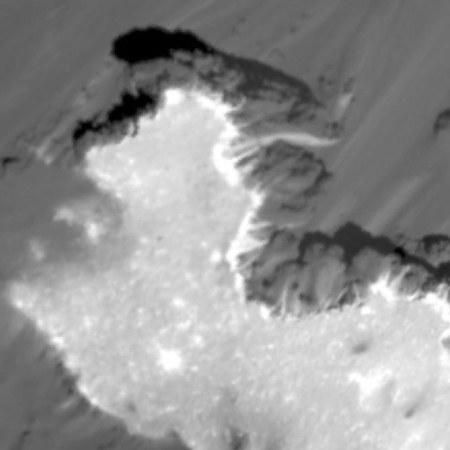 Along with some scattered bright spots, the white material appears to have a bright area aligned along the cliff’s rim. The white material also appears to be flowing down one gully in that cliff face. It is important to remember that these bright spots are generally found in a depression in the crater. scientists now think they are remnants of a volcano-like mound that after erupting slowly slumped back down. 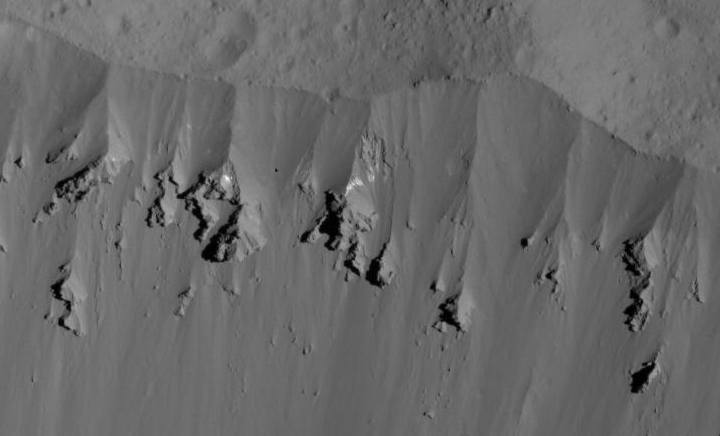 Note also that the soft puffiness of the cliff faces probably indicates the lower density of this material due to Ceres’s tiny gravity, about 3% that of Earth’s. On Monday the Dawn science team released more close-up images of Ceres, taken from Dawn’s final close orbit of the dwarf planet, with the focus of this release Occator Crater and its bright spots. The current images now show numerous sections of Occator Crater from an altitude of 35 kilometers and with a resolution less than 5 meters per pixel. “The data exceeds all our expectations,” Dr. Andreas Nathues from the MPS, Framing Camera Lead Investigator, says. In the new images, the surface is now ten times better resolved than in the best images from the previous three years. Impressive avalanches reveal themselves in the new views of the eastern wall of Occator Crater: there are clear signs that material has been recently moving down the slopes; some of it remains stuck halfway. Other images allow a close look at the interplay of bright and dark material in the eastern part of the crater. 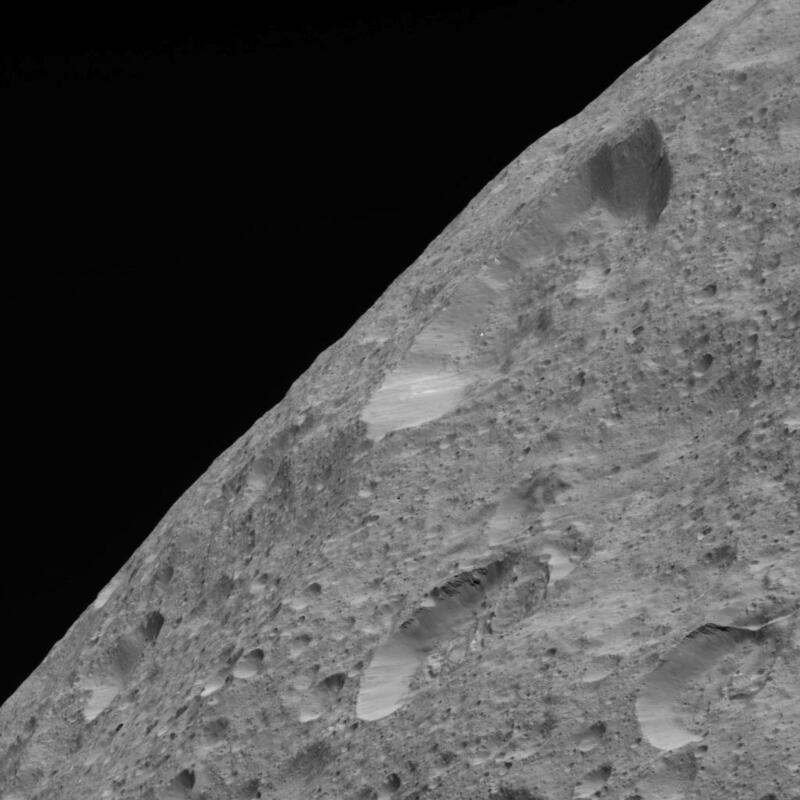 “We now hope to understand how the bright deposits outside the crater center came about – and what they tell us about Ceres’ interior,” says Nathues. 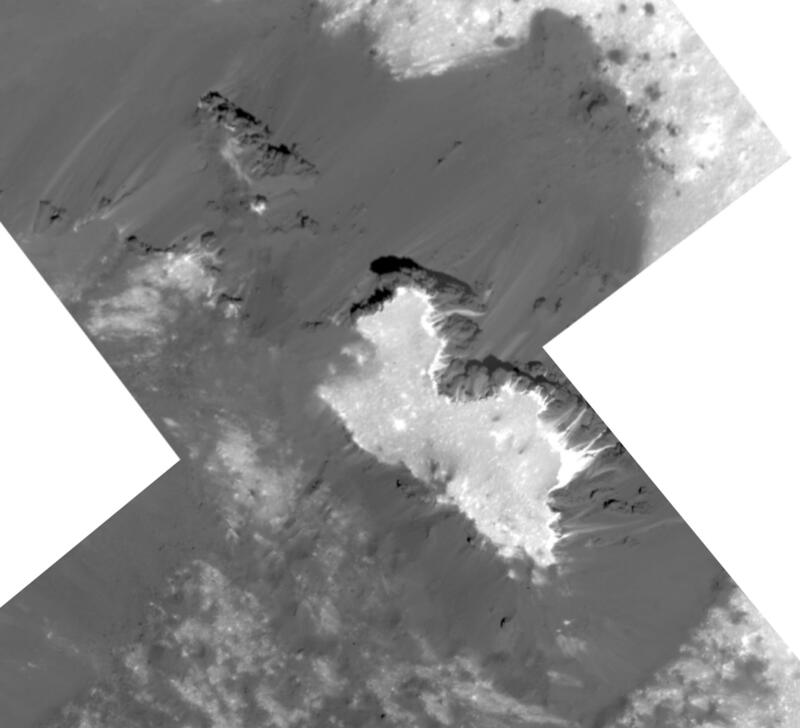 Various analyses of the past years suggest that Ceres has a water-rich crust. Small impacts and landslides regularly expose ice at the surface, which produces a thin exosphere of water vapor. I have posted some of these images previously, but there are several new ones at the link. Cool image time! Dawn, now in its final very close orbit above the surface of Ceres, has released some new images. 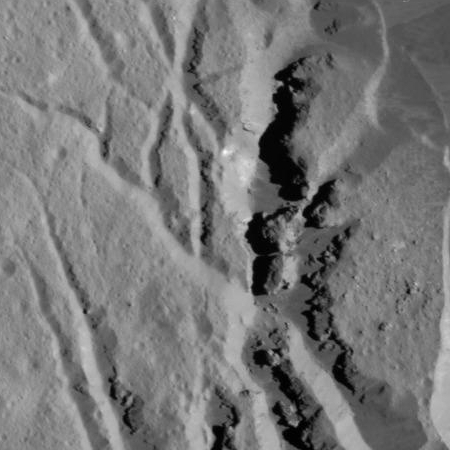 The image on the right, cropped to post here, was taken from a distance of only 22 miles, and shows a fracture network and some very pronounced cliffs on the wall of Occator Crater. The sunlight is coming from the right. You can also see a bright spot on an east-facing slope with what looks like an apron of lighter avalanche material below it. The flat smooth surface of the floor of this same canyon is likely because it is filled with dust, which has ponded there. These fractures suggest that the wall of the crater is undergoing a slow motion avalanche, with sections separating off and slowly sagging into the crater below, creating the fractures. Cool image time! With Dawn completing its descent into its final low orbit only about 30 miles above the surface of Ceres, it is beginning to take some very spectacular images. Above is a cropped section from a full image taken on June 9th of the rim of Occator Crater from an altitude of 27 miles. It shows evidence of landslides on the crater’s rim, as well as at least two bright patches. If you click on it you can see the entire picture. Nor is this the only cool image released As Dawn descended to its new orbit, it took one very cool oblique image of the planet’s horizon. On the right I have cropped a small section out of one such image, taken on May 30th from an altitude of 280 miles. If you click on it you can see the full image, showing numerous other small craters all around it, to the horizon. Note the bright streaks on the crater walls, suggestive of more landslides as well as seepage of the thought-to-exist brine from below the surface. 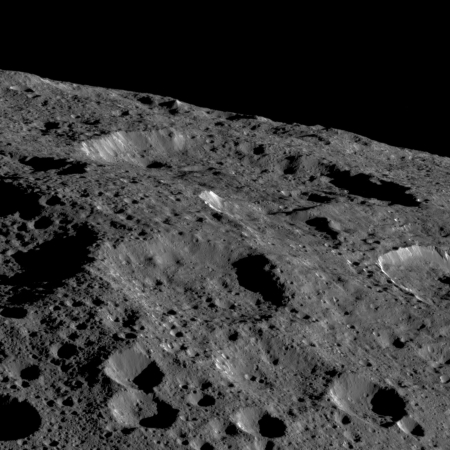 For the next year or so, as Dawn winds down its mission, expect a lot more very intriguing pictures of Ceres. I am especially eager to see close-ups of the bright spots at the center of Occator Crater. The uncertainty of science: A new analysis of data from Dawn now suggests that the surface of Ceres has a greater percentage of organic molecules than previously estimated. To get an initial idea of how abundant those compounds might be, the original research team compared the VIR data from Ceres with laboratory reflectance spectra of organic material formed on Earth. Based on that standard, the researchers concluded that between six and 10 percent of the spectral signature they detected on Ceres could be explained by organic matter. But for this new research, Kaplan and her colleagues wanted to re-examine those data using a different standard. Instead of relying on Earth rocks to interpret the data, the team turned to an extraterrestrial source: meteorites. Some meteorites — chunks of carbonaceous chondrite that have fallen to Earth after being ejected from primitive asteroids — have been shown to contain organic material that’s slightly different from what’s commonly found on our own planet. And Kaplan’s work shows that the spectral reflectance of the extraterrestrial organics is distinct from that of terrestrial counterparts. Please note: Both estimates depend on assumptions that could easily be wrong. Ceres might have less organics, or more, than either estimate. Or somewhere in the middle. These estimates are merely educated guesses. And remember, organic molecules does not mean life. It only means the molecules use carbon as a component. In June the spacecraft Dawn will be lowered to its closest orbit ever to the dwarf planet Ceres, only 30 miles above its surface. This will be its final orbit, as the spacecraft’s life is approaching its end. New data from Dawn has found at least one spot on Ceres where recent changes appear to have occurred on the surface. Observations obtained by the visible and infrared mapping spectrometer (VIR) on the Dawn spacecraft previously found water ice in a dozen sites on Ceres. The new study revealed the abundance of ice on the northern wall of Juling Crater, a crater 12 miles (20 kilometers) in diameter. The new observations, conducted from April through October 2016, show an increase in the amount of ice on the crater wall. “This is the first direct detection of change on the surface of Ceres,” said Andrea Raponi of the Institute of Astrophysics and Planetary Science in Rome. There is a certain irony here. For eons, the only alien body that humans were able to get a good look at, the Moon, was also an object where almost nothing changed. Even today, after humans have visited its surface and numerous orbiting spacecraft have photographed its surface in numbing detail, the Moon has generally been found to be stable and unchanging. Though impacts do occur, and the surface does evolve over time, the Moon is probably one of the most static bodies in the solar system. The irony is that this lunar stability gave us an incorrect impression of the rest of the solar system. Based on the Moon, it was assumed that airless or almost airless bodies like Mercury, Mars, Pluto, the large moons of Jupiter and Saturn, and asteroids like Ceres would also be stable and unchanging. What we have instead found is that the Moon is the exception that proves the rule. Most of these other worlds are unlike the Moon. They show a lot of surface evolution, over relatively short time scales. They change. Cool image time! 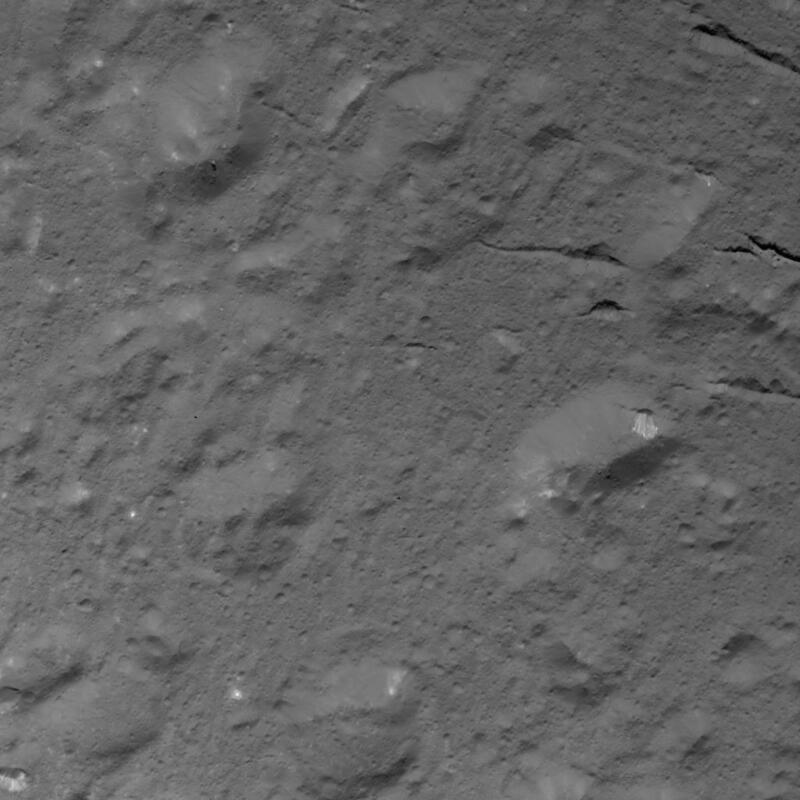 The Dawn science team has released an image of Ceres, cropped to post here in the right, that shows a spiderweb of fractures radiating out from a single point in the floor of Occator Crater. These fractures have been interpreted as evidence that material came up from below and formed a dome shape, as if a piston was pushing Occator’s floor from beneath the surface. This may be due to the upwelling of material coming from Ceres’ deep interior. An alternative hypothesis is that the deformation is due to volume changes inside a reservoir of icy magma in the shallow subsurface that is in the process of freezing, similar to the change in volume that a bottle of water experiences when put in a freezer. In the image sunlight is coming from the right. This fractured area can be seen in this earlier simulated oblique image of Occator Crater, in the southwest corner of the crater floor, well away from the crater’s more well known bright areas. Based on the data obtained of Ceres from Dawn scientists have concluded that a variety of geological activities caused the bright areas on the planet, and that some of those activities could still be happening today. Since Dawn arrived in orbit at Ceres in March 2015, scientists have located more than 300 bright areas on Ceres. A new study in the journal Icarus, led by Nathan Stein, a doctoral researcher at Caltech in Pasadena, California, divides Ceres’ features into four categories. The first group of bright spots contains the most reflective material on Ceres, which is found on crater floors. 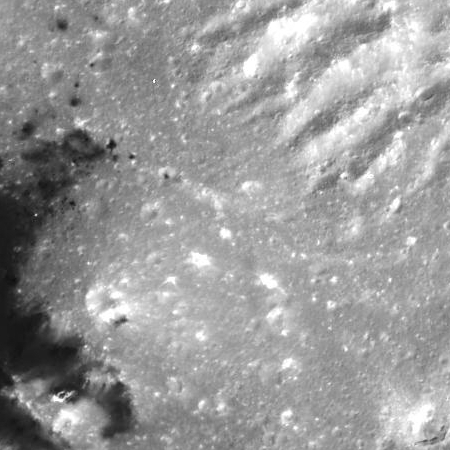 The most iconic examples are in Occator Crater [shown in the image above, reduced and cropped to post here], which hosts two prominent bright areas. 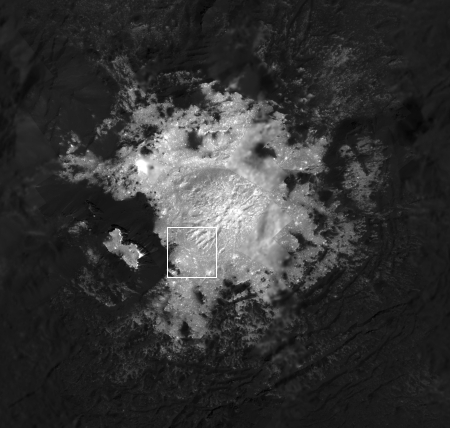 Cerealia Facula, in the center of the crater, consists of bright material covering a 6-mile-wide (10-kilometer-wide) pit, within which sits a small dome. East of the center is a collection of slightly less reflective and more diffuse features called Vinalia Faculae. All the bright material in Occator Crater is made of salt-rich material, which was likely once mixed in water. Although Cerealia Facula is the brightest area on all of Ceres, it would resemble dirty snow to the human eye. The mountain Ahuna Mons gets its own fourth category — the one instance on Ceres where bright material is unaffiliated with any impact crater. This likely cryovolcano, a volcano formed bythe gradual accumulation of thick, slowly flowing icy materials, has prominent bright streaks on its flanks. The report is somewhat vague about why they think that there might be some geological activity even today. The image above, released as part of this press release, gives us a simulated oblique look at Occator Crater and its bright areas. It is definitely worth it to look at the full resolution image. An ancient ocean on Ceres? Two studies released today by the Dawn science team suggest that the spacecraft has found evidence that an ancient ocean once existed on Ceres. In one study, the Dawn team found Ceres’ crust is a mixture of ice, salts and hydrated materials that were subjected to past and possibly recent geologic activity, and this crust represents most of that ancient ocean. The second study builds off the first and suggests there is a softer, easily deformable layer beneath Ceres’ rigid surface crust, which could be the signature of residual liquid left over from the ocean, too. NASA has decided to extend the Dawn mission again, but have that extension remain in orbit around Ceres. A priority of the second Ceres mission extension is collecting data with Dawn’s gamma ray and neutron spectrometer, which measures the number and energy of gamma rays and neutrons. This information is important for understanding the composition of Ceres’ uppermost layer and how much ice it contains. 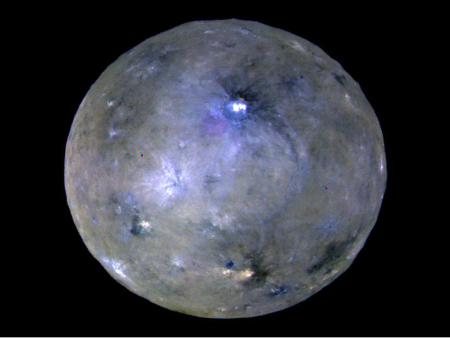 The spacecraft also will take visible-light images of Ceres’ surface geology with its camera, as well as measurements of Ceres’ mineralogy with its visible and infrared mapping spectrometer. The extended mission at Ceres additionally allows Dawn to be in orbit while the dwarf planet goes through perihelion, its closest approach to the Sun, which will occur in April 2018. At closer proximity to the Sun, more ice on Ceres’ surface may turn to water vapor, which may in turn contribute to the weak transient atmosphere detected by the European Space Agency’s Herschel Space Observatory before Dawn’s arrival. 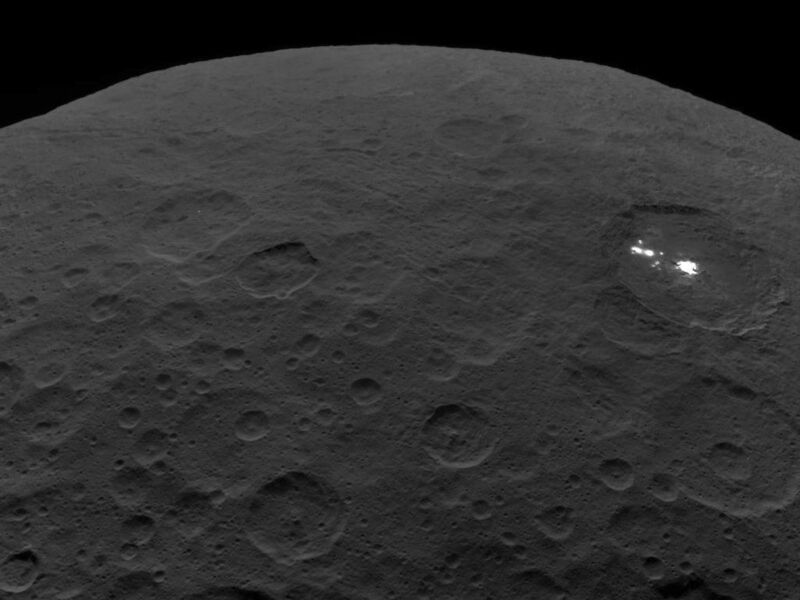 Building on Dawn’s findings, the team has hypothesized that water vapor may be produced in part from energetic particles from the Sun interacting with ice in Ceres’ shallow surface.Scientists will combine data from ground-based observatories with Dawn’s observations to further study these phenomena as Ceres approaches perihelion. They aim to get as close as 120 miles of the surface during this extension, half as close as the previous closest approach. Will Dawn head to another asteroid? NASA is still reviewing the proposal by the Dawn science team that they send the spacecraft to another asteroid in its last years before its fuel runs out. The spacecraft has continued operations despite problems with its reaction wheels, used for attitude control. After suffering the loss of two of its four reaction wheels earlier in the mission, a third wheel malfunctioned in April. The spacecraft went into safe mode briefly, but controllers resumed operations with hydrazine thrusters taking over for the failed wheel. That failure will eventually lead to the end of the mission when the spacecraft runs out of hydrazine. “It does reduce our lifetime because we have to use hydrazine at a faster rate,” Raymond said at the SBAG meeting in June. That lifetime, she said, is dependent on the spacecraft’s orbital altitude. Dawn has spiraled out to a higher orbit during its extended mission, which reduces the amount of hydrazine needed for attitude control. “The lifetime is now highly dependent on orbital altitude because we need to use the jets to fight the gravity gradient torques,” she said. In its current high orbit, Raymond said that Dawn had sufficient hydrazine, as well as xenon propellant used for the ion engine, to operate at least through the end of 2018. Cool image time! The image on the right, reduced in resolution to show here, was taken by Dawn on April 29, 2017, when the spacecraft had been positioned between the Sun and the dwarf planet at a moment when its entire surface was lit. They have enhanced the colors to bring out the contrasts. Images combining these different color filter perspectives reveal fine details of Ceres’ surface. For example, they emphasize the distinct compositions and textures of the material ejected from craters. The brightest region on Ceres, called Cerealia Facula, is highlighted in Occator Crater in the center of this image. Vinalia Faculae, the set of secondary bright spots in the same crater, are located to the right of Cerealia Facula. One of the darkest regions on Ceres is next to Occator, and represents ejected material from the impact that formed the crater. The ejected material forms a large arc that extends over several hundred kilometers, below the center of Ceres in this image. That material’s distribution is partly determined by Ceres’ rotation. The third of four reaction wheels on Dawn failed on April 23, forcing the spacecraft to use its conventional thrusters to orient itself. The team discovered the situation during a scheduled communications session on April 24, diagnosed the problem, and returned the spacecraft to its standard flight configuration, still with hydrazine control, on April 25. The failure occurred after Dawn completed its five-hour segment of ion thrusting on April 22 to adjust its orbit, but before the shorter maneuver scheduled for April 23-24. The orbit will still allow Dawn to perform its opposition measurements. The reaction wheel’s malfunctioning will not significantly impact the rest of the extended mission at Ceres. This might shorten Dawn’s remaining mission, but since it is in its final days anyway, the loss will not be severe. 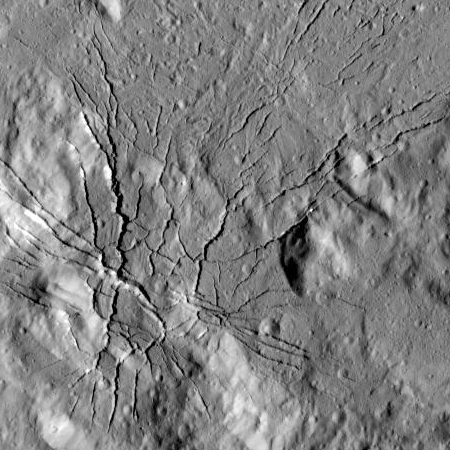 An analysis of data from Dawn has shown that Ceres’s landslides are distributed in greater numbers towards the poles, which suggests the presence of water ice just below the surface. The data also showed that Ceres has far more landslides than expected, which also supports the idea that the shallow subsurface has a lot of water ice in it, as much as 10% to 50% by volume. Using crater counts and a careful analysis of features in Occator Crater on Ceres, scientists have estimated that the last major eruption occurred about 4 million years ago. Nathues and his team interpret the central pit with its rocky, jagged ridge as a remnant of a former central mountain. It formed as a result of the impact that created Occator Crater some 34 million years ago and collapsed later. The dome of bright material is much younger: only approximately four million years. The key to determining these ages was the accurate counting and measuring of smaller craters torn by later impacts. This method’s basic assumption is that surfaces showing many craters are older than those that are less strongly “perforated”. Since even very small craters are visible in highly resolved images, the new study contains the most accurate dating so far. “The age and appearance of the material surrounding the bright dome indicate that Cerealia Facula was formed by a recurring, eruptive process, which also hurled material into more outward regions of the central pit”, says Nathues. “A single eruptive event is rather unlikely,” he adds. A look into the Jupiter system supports this theory. The moons Callisto and Ganymede show similar domes. Researchers interpret them as volcanic deposits and thus as signs of cryovolcanism. The volcano itself has slumped away, leaving behind the bright depression. Whether any cryovolcanism is still occurring underground remains unknown. The spacecraft Dawn has detected evidence of organic molecules in Ceres’ northern hemisphere. The organic materials on Ceres are mainly located in an area covering approximately 400 square miles (about 1,000 square kilometers). The signature of organics is very clear on the floor of Ernutet Crater, on its southern rim and in an area just outside the crater to the southwest. Another large area with well-defined signatures is found across the northwest part of the crater rim and ejecta. There are other smaller organic-rich areas several miles (kilometers) west and east of the crater. Organics also were found in a very small area in Inamahari Crater, about 250 miles (400 kilometers) away from Ernutet. This detection does not mean that Dawn has found life on Ceres. It means that the spacecraft has detected molecules that contain carbon, which is the chemical definition of organics. Nor is it unusual for asteroids to have carbon molecules. In fact, there is an entire asteroid class dubbed carbonaceous chondrites that are rich in carbon. In addition, the press release overplays this narrative by making it seem as if the discovery of organics in the solar system is rare and unusual. It is not. Molecules containing carbon have been found in many places, on Mars, on Venus, in asteroids, and elsewhere. All that is happened here is that the scientists have gained more information about the make-up Ceres itself. This is good, but it isn’t what is being sold by the press release. New research based on Dawn data suggests that volcanoes on Ceres flatten and disappear over time. 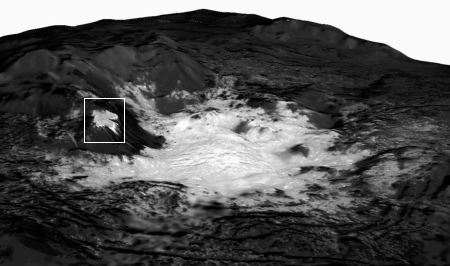 NASA’s Dawn spacecraft discovered Ceres’s 4-kilometer (2.5-mile) tall Ahuna Mons cryovolcano in 2015. Other icy worlds in our solar system, like Pluto, Europa, Triton, Charon and Titan, may also have cryovolcanoes, but Ahuna Mons is conspicuously alone on Ceres. The dwarf planet, with an orbit between Mars and Jupiter, also lies far closer to the sun than other planetary bodies where cryovolcanoes have been found. Now, scientists show there may have been cryovolcanoes other than Ahuna Mons on Ceres millions or billions of years ago, but these cryovolcanoes may have flattened out over time and become indistinguishable from the planet’s surface. They report their findings in a new paper accepted for publication in Geophysical Research Letters, a journal of the American Geophysical Union. 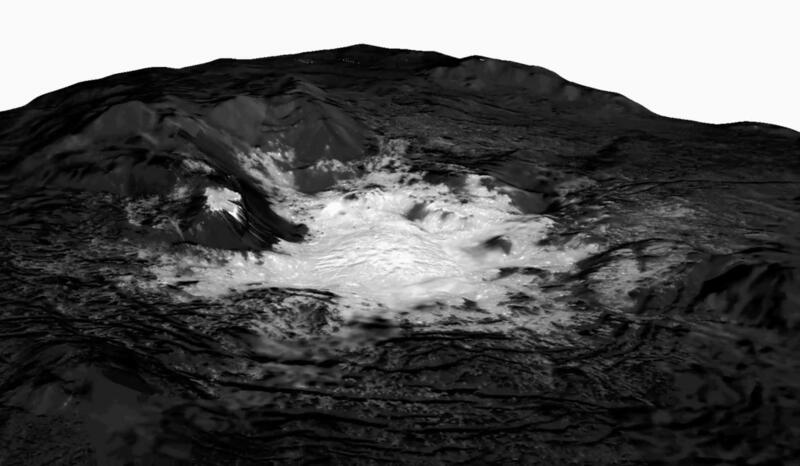 “We think we have a very good case that there have been lots of cryovolcanoes on Ceres but they have deformed,” said Michael Sori of the Lunar and Planetary Laboratory at the University of Arizona in Tucson, and lead author of the new paper. The cause of the flattening? Viscous relaxation is the idea that just about any solid will flow, given enough time. For example, a cold block of honey appears to be solid. But if given enough time, the block will flatten out until there is no sign left of the original block structure. On Earth, viscous relaxation is what makes glaciers flow, Sori explained. The process doesn’t affect volcanoes on Earth because they are made of rock, but Ceres’s volcanoes contain ice – making viscous relaxation possible.